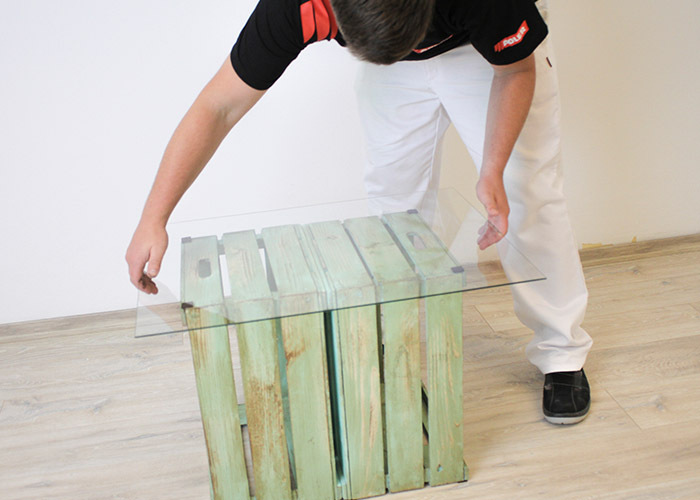 Crafting creative pieces of furniture yourself from the simplest materials is very much in vogue: "upcycling" is the magic word. 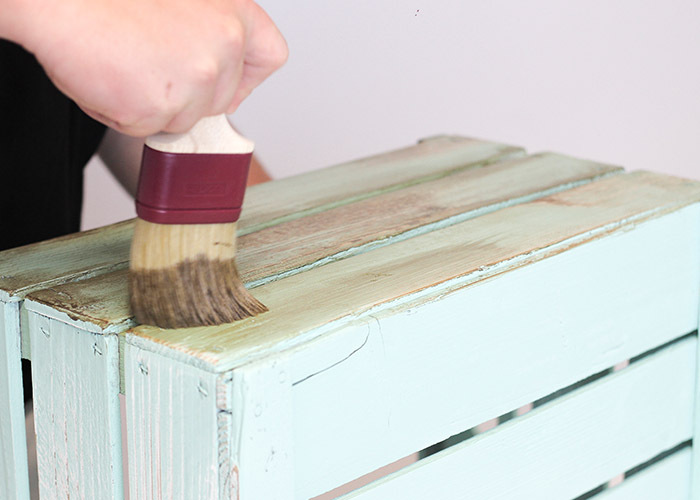 We'll show you how to make a pretty coffee table in trendy vintage style out of old wine or fruit boxes. First and foremost, you have to find old fruit or wine boxes. They are no longer easy to find because what was previously thought of as "rubbish" is now considered a sought-after furniture material. Much like with pallets, many retailers have switched to deposit systems. But it's not a big deal, luckily wine boxes can be found in craft shops or bought online. JDepending on whether you are working with "new" old boxes or with original transport boxes, you have to tackle the pretreatment. Boxes that used to be filled with apples, pears or grapes certainly need to be cleared of dust, leaves and dried-up fruit residues. So grab a hand brush and sweep the box carefully. Those who have ordered a "clean" box can proceed to step 2. GSecond hand is nice, but we don't want to get any splinters. 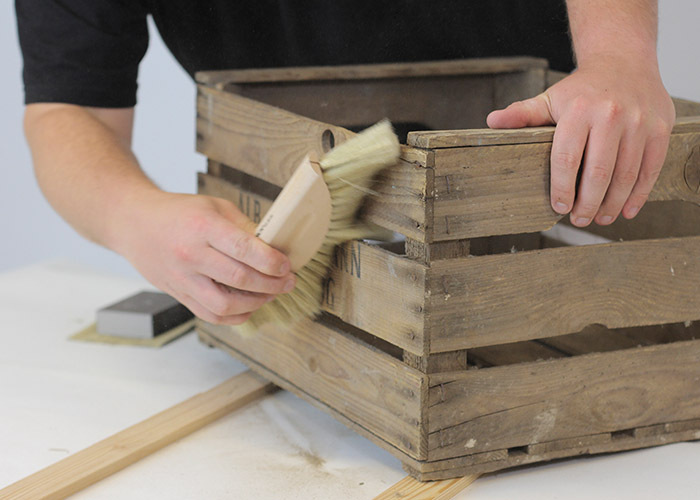 That's why it is important to smooth the wood fibres of the boxes in advance. 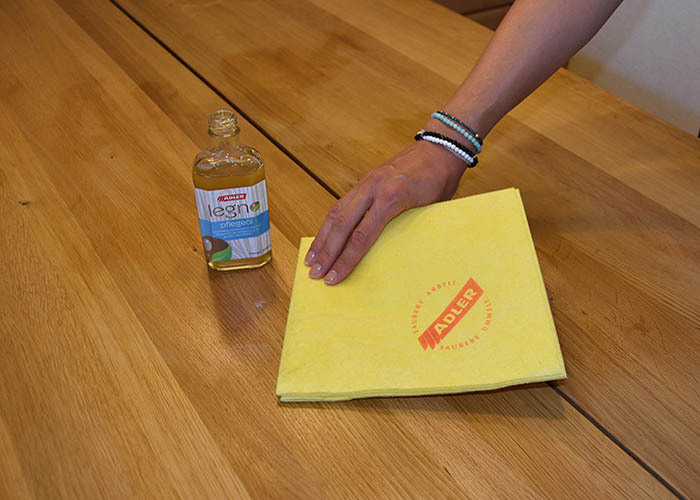 To do this, choose sandpaper with grain size 120 and work carefully on all surfaces and edges. Wine boxes have a particularly beautiful appearance when their original character is emphasised by multi-coloured design. We therefore chose a broken white tone (e.g. RAL 9016) as the base colour. Apply a prime coat to all surfaces with the acrylic paint ADLER VariColor in the appropriate colour shade.It is best to leave the boxes to dry overnight. Delicate pastel shades, such as rose, sky blue or mint green are perfectly suitable for the vintage look. The turquoise version appealed to us. 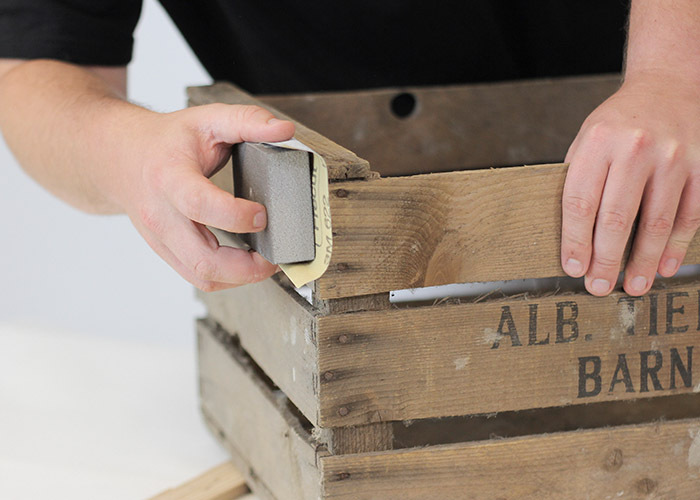 Coat the white wine box again with ADLER VariColor. 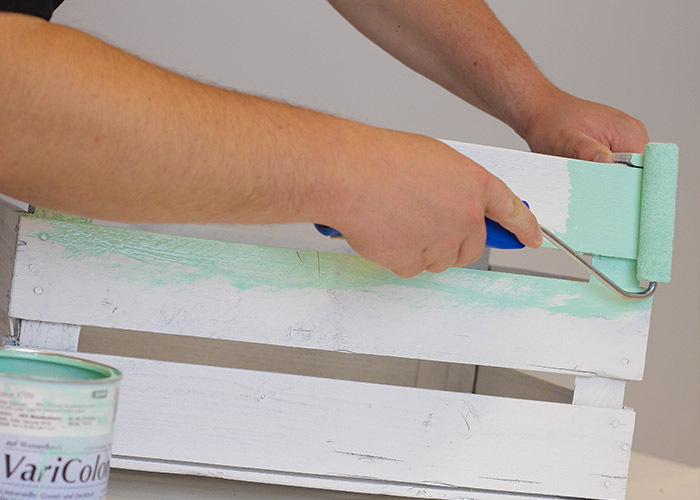 For the corners and edges it would be best to use a paint brush, the surfaces can also be well coated with a small roller. DThen once more a few hours' drying time are required. The cool vintage look is now created by reaching for the sandpaper once again. 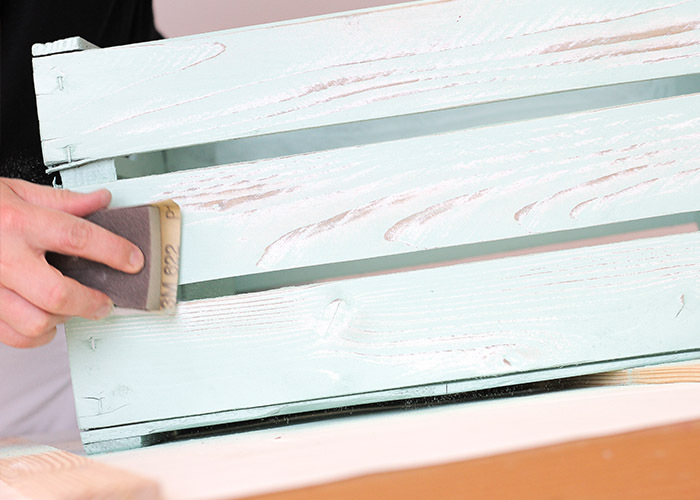 Sand the desired areas so that the upper layer of paint peels off and the white primer shines through. This has a natural wear effect which results in the boxes acquiring a "used" look. To do this, apply the ADLER Innenlasur in the colour shade Palisander (rosewood). 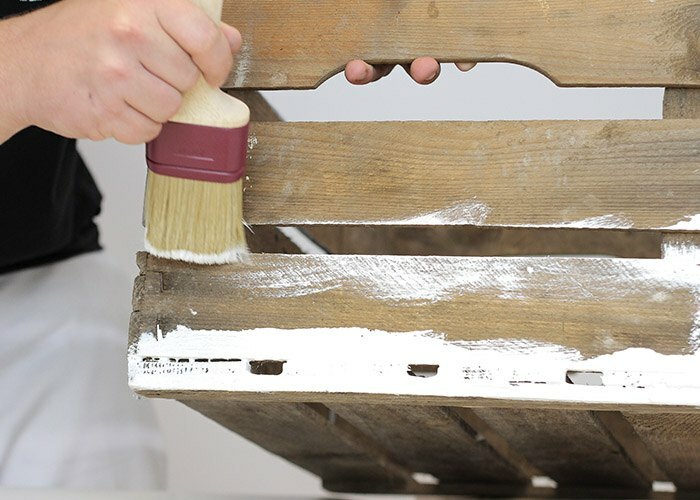 Excess paint can be wiped or removed with a cloth. Once the paint has dried well, you can work on the boxes as you wish. We have screwed two boxes together back to back – like this the openings can be used as perfect storage space for magazines, books, etc. The boxes are covered by a sheet of glass. And completely in line with your taste, rollers make the new side table mobile, or you can add felt pads for floor-protecting stability. Now all you need to do is find a suitable place for your new piece of furniture. Simply place a bottle of wine or some fruit on top. Then watch your friends and acquaintances admire the creative, unique item.